31 January 2019 in the case of M/S Allied Blenders and Distillers Pvt. Ltd. v. Govind Yadav & Anr seems to support closer scrutiny. 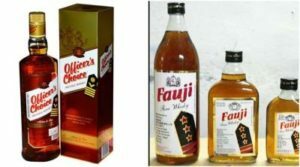 In this case, the Court ruled that the trademarks “Officer’s Choice” and “Fauji’s” were not deceptively similar. The plaintiff had trademarked the term ‘Officer’s Choice’ in the year 1988 and was using this for alcoholic beverages. The defendants were using the mark ‘Fauji’ with respect to the same products. The plaintiff argued that the literal translation of the term “Fauji” would be “military officer”. Also, since they were in the same business, the likelihood of confusion among the consumers would be high. The Court held that the trademarks were not similar. The words were phonetically different and, whilst the expression “officer” referred to “a person in power”, the term “Fauji” meant a simple soldier. The case laws relied on by the plaintiff was not accepted by the Court. In particular, the plaintiff relied on the earlier judgment of 8 February 1994 in the case of M/s Surya Roshini Ltd. v. M/s Electronic Sound Components Co., where the Delhi High Court had held that there was deceptive similarity between the trademarks “Surya” and “Bhaskar” as both marks are literal translations of the word ‘Sun’. Similarly, in the case of M/s Bhatia Plastics v. M/s Peacock Industries Ltd., the two trademarks “Peacock” and “Mayur” were held to be deceptively similar as both represented a bird. It is to be noted that in such cases, the marks were literal translations, which was not the case in the Fauji matter. The concept of deceptive similarity is, however, not limited to conceptual similarity. In the case Mahendra and Mahendra Paper Mills Ltd. v. Mahindra and Mahindra Ltd., the Supreme Court decided in 2001 that the name “Mahendra & Mahendra” infringed the earlier business name “Mahindra” which had been in use for over five decades and had acquired distinctiveness and a secondary meaning as a result, basing this on phonetic similarity.